During the era of 35mm film, most important part of making a movie is getting the money. Without money you can’t get your film stock, you can’t process the negative, you can’t get a work print and you can’t afford a final print. Plus you need money for everything else in the film. There’s not many filmmakers who have $10 million to blow on a low budget film. So you go to be nice to the money. Terry Gilliam had an issue being nice to the money or at least the people who provided the money for his film. After his time in Monty Python, he struck comic gold with Time Bandits produced by ex-Beatles’ George Harrison’s Handmade films. His next film was Brazil had him clash with Universal over the US release. Things got worse when the budget went out of control on The Adventures of Baron Munchausen. Gilliam’s reputation was in tatters and the money didn’t want to trust him with his projects. So Gilliam had to play nice and be a director for hire for producers that wanted a Terry Gilliam director. He made a bit of a comeback with The Fisher King. The money realized he could be nice to them. Arrow Video has released two of his subsequent films in 12 Monkeys and Tideland. 12 Monkeys is based on Chris Marker’s amazing short film La Jetée. The original is basically a batch of still photographs with a few seconds of motion so this isn’t a straight adaptation. Gilliam gets to bring his visual flare to a tale of time travel from a future that’s uninhabitable. Scientists of tomorrow have created a time travelling machine with the sole purpose of going back and stopping the virus that destroyed humanity. But in order to make it work, they have to find a person who has a strong memory of that time. James Cole (Bruce Willis) is a prisoner who remember a woman’s face during a visit to the airport in 1996. Cole is sent back in time except he ends up in 1990 and locked up inside an mental asylum. Dr. Kathryn Railly (The Last of the Mohicans ‘ Madeleine Stowe) thinks Cole isn’t the usual babbling person with tales of how he has to stop the apocalypse. He has to stop the Army of the 12 Monkeys from freeing the virus. But of course nobody knows what the 12 Monkeys are. While locked inside, he meets Jeffrey Goines (Fight Club‘s Brad Pitt) who wants to help him break out. Goines has radical views about things, but doesn’t seem like a threat. Cole breaks out, but his escape is hampered by getting sucked back into the future. He has to go back for so many reasons. 12 Monkeys holds up as a sci-fi flick with Gilliam’s touches adding to the unstable elements of a world that doesn’t know it needs to be saved. Bruce Willis doesn’t overwhelm the role. Brad Pitt pulls off the twitchy madness what seemed like an outsider character at the start. Stowe keeps dealing with the reality that maybe the insane sounding guy is real. Plus there’s a killer part from Frank Gorshin (The Riddler on Batman). Gilliam was able to make his own impact on the film instead of just recycling Marker’s La Jetée. The film was a success at the box office and Brad Pitt was nominated for an Oscar. But Gilliam wouldn’t come all the way back after back to back successes. He landed Hunter S. Thompson’s Fear and Loathing in Las Vegas which seemed the perfect project since the book’s original illustrations by Ralph Steadman seemed kin to the animation that Gilliam was doing on Monty Python’s Flying Circus at the same time in the ’70s. The film bombed. And then Gilliam made The Brother Grimm which led to plenty of public spats with Harvey Weinstein over editing and releasing the film. It was nearly two years after the first suggest release date before it showed up in theaters. It took so long that Gilliam was able to go off an make the independently funded Tideland. If you’re going to see Tideland based on Jeff Bridges (The Big Lebowski), you’ll be a bit confused. This is the story about his character’s daughter. 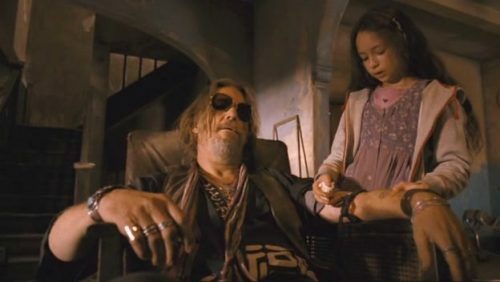 Jeliza-Rose (Twilight‘s Jodelle Ferland) is a child in a very bleak situation with a massive imagination. Her father is a rock star (Bridges) and her mother is a stay at home mess (Bound‘s Jennifer Tilly). When mom has a medical emergency, dad grabs Jeliza-Rose and decides it’s time to head to a house in the Texas country-side. While she explores the new space, dad decides to have a little nod vacation by tying up a vein. This is a bizarre film that involves human taxidermy and blowing up railroad tracks. There’s so much to see on the screen, but at the same time there’s so much to make an viewer feel squeamish. Tideland didn’t get much promotion or attention upon release. The original distributor ThinkFilm didn’t give it much of a chance. Gilliam went on his own campaign to promote it including showing up and pitching the movie to the people waiting in line for talkshows taped around New York City. The film deserves to be discovered once more just on the basis of Ferland’s remarkable performance. She does a lot of work to make us believe that she’s able to block out the reality of her sad situation. 12 Monkeys and Tideland are both finer moments in Gilliam’s career that often has more drama between him and the money men than between the characters on the screen. The video is 2.35:1 for both films. The transfers are sharp and bring out the detail in the frame. The audio for both is 5.1 and 2.0 DTS Master Audio. The levels bring out the chaos in the mixes as Gilliam digs into the madness of the scenes. Both movies are subtitled. Audio commentary by Terry Gilliam and producer Charles Roven breaks down how Gilliam approached the film and his time with the cast. The Hamster Factor and Other Tales of Twelve Monkeys (87:34) is a feature-length making-of documentary by Keith Fulton and Louis Pepe. They were responsible for Lost in La Mancha. They have him backstage at Late Night with David Letterman. This gets deep into the movie’s behind the scenes and gives a glimpse at what it was like working with Bruce Willis and Brad Pitt in the ’90s. They mention that Terry made the film as a director for hire since the script was developed by another filmmaker and its backed by a major studio. The Film Exchange with Terry Gilliam (23:50) is a 1996 interview with Gilliam and critic Jonathan Romney, recorded at the London Film Festival. Gilliam mentions how Chris Marker was happy the film wasn’t a direct remake. Brand-new appreciation by Ian Christie (16:11) the author of Gilliam on Gilliam. He talks about how the director wanted to reform his reputation as a difficult director who didn’t work well with the money people. He points out that 12 Monkeys wasn’t a studio mega-budget. But Terry worked with the money. 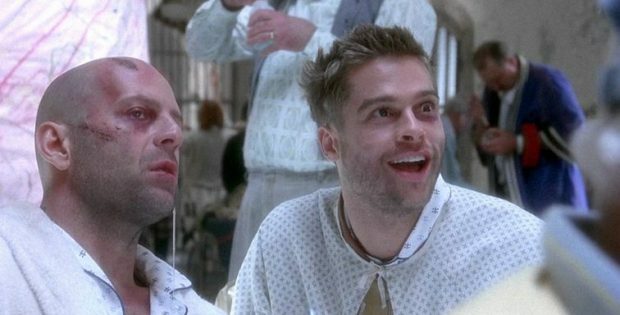 The Twelve Monkeys Archives (39:32) includes logo designs, costume designs, location photos, storyboards, production photos, costume Polaroids and movie posters. Theatrical trailer (2:26) hints at the time travel aspect. Arrow Video presents 12 Monkeys. Directed by: Terry Gilliam. Screenplay by: David Peoples & Janet Peoples. Starring: Bruce Willis, Madeleine Stowe, Brad Pitt, Christopher Plummer & Christopher Meloni. Rated: R. Running Time: 129 minutes. Released: October 30, 2018. Audio Commentary by writer-director Terry Gilliam and co-writer Tony Grisoni talks about the adaptation of the novel. Introduction by director Terry Gilliam (1:08) promises that people will either, like, not like or think if they liked or didn’t like. He wants us to view it as a child like Jeliza-Rose. Getting Gilliam (44:46) is about making of Tideland by Vincenzo Natali (Cube, Splice). Opens with Terry relieving himself next to a river. The film is a bit introspective as Natali speaks of how Gilliam impacted his life. Gilliam starts working on Tideland in Canada while battling Harvey Weinstein on the final edit of The Brothers Grim. He speaks of not wanting to deal with the money people. The Making of Tideland (5:26) is the small version to get people pumped into seeing it. Mitch Cullin, the author of the book knows that this is Terry Gilliam’s film. Filming Green Screen (3:13) with commentary by Gilliam explains how the trippy effects are achieved to show how his actress swims on wires instead of water. Interviews with Terry Gilliam (14:30), producer Jeremy Thomas (9:33) and actors Jeff Bridges, Jodelle Ferland and Jennifer Tilly (4:59) discuss how the film is a bit of Grimms’ fairy tale. Deleted scenes (5:56) includes commentary by Gilliam which talks about why the scenes didn’t work in the big narrative. B-roll footage (20:35) has the second crew filming a truck shot with a giant boom. Gallery (2:01) has production photos. Theatrical trailer (1:54) has the action focused on the daughter. Arrow Video presents Tideland. Directed by: Terry Gilliam. Screenplay by: Terry Gilliam and Tony Grisoni. Starring: Jodelle Ferland, Brendan Fletcher, Janet McTeer, Jennifer Tilly and Jeff Bridges. Rated: PG-13. Running Time: 120 minutes. Released: August 12, 2018.